Our silos, either flat or hopper bottom, are used for extended storage of large quantities of grain, seeds and granulate products. Our range of concrete base silos cover capacities ranging from 83 m3 to 45,055 m3 and with diameters from 4.58 m to 41.25 m.
Our flat bottom silos are manufactured with galvanised steel S350GD of high elastic tolerance and with Z600 minimum coating equivalent to 600 g/m2 of zinc. Washers with neoprene to ensure a waterproof seal. Galvanised cross section roof structure on models with a diameter superior to 12,22 meters. Stairs and platforms comply with regulation UNE-EN ISO 14122. 8,8 quality dichromate high tensile bolts in all of our product range. Galvanised reinforced exteriors, regardless of thickness, that provide excellent anti-corrosion qualities. Our method for calculating thickness is more demanding than that established by standard EUROCODIGO 1. The Bobcat door opening is ideal for high-capacity silos which are unloaded using light Bobcat machinery so the product residual slope is emptied. It is made with a rigid frame featuring pillars that transmit the loads to the ground and horizontal reinforcements. Framework comprised of perforated grating made of galvanised steel. The minimum standard ventilation surface is 15% and may even reach 100%. We also offer reinforced ventilation grating for drive-thru machinery. Our lateral unloading system means a truck can be loaded directly from the silo without the need for additional machinery. It includes a manual drive discharge gate. The roof staircase complies with our clients’ most demanding expectations combining accessibility, safety and comfort for comprehensive plant maintenance. 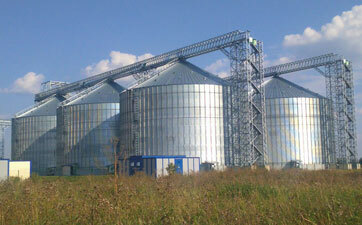 For proper grain conditioning and conservation, among other reasons, we use ventilation systems for silos of all capacities and for all types of grains. 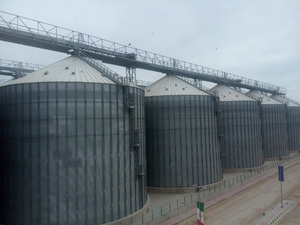 The necessary ventilation system is determined for each system following a technical study of the system and considering the type of grain, the environmental conditions, the silo capacity and dimensions. Silos Córdoba sweeping machines adapt to all of our silo diameters and can be complemented with accessories that enhance emptying by eliminating all existing residue between the sweeping machine and the ground. Complies with the ATEX standards required for work inside a silo. The inner silo staircase makes for easy access to the inside of the silo for maintenance tasks and visual analysis of the product within. The winding staircase is a perimeter staircase specially designed for easier access to the silo in a comfortable and safe way. Enables easy maintenance.